Planeswalker Nissa Revane gathers her forces to protect Zendikar from annihilation. Drawing on the power of the land itself, she summons mighty Elementals to overwhelm her foes. 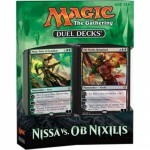 Trapped on Zendikar for centuries, the demon Ob Nixilis will do anything to reignite his Planeswalker spark and escape. He summons terrifying Demons and wields dark, destructive powers to lay his enemies to waste. The stakes are high as Nissa and Ob Nixilis fight to control the power of the Khalni Heart. Who will prevail?